Our goal is that the services we offer are characterized by their innovativeness and high quality at the same time. We work with specialized suppliers and this allows us to provide the best quality in products and services. All orders are processed on the basis of your technical or model documentation. Each order will be analysed and examined with due care and we will offer you the best and most advantageous solution. We will process your order as soon as possible. 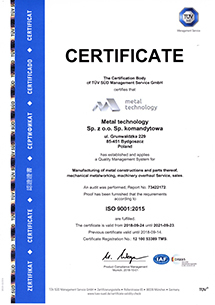 Metal Technology stands for high quality services. Our highly-qualified staff and well-equipped machinery facility is at your disposal. We contribute engagement and experience in conventional and CNC machining, as well as in welding to order. Choose us as your partner!